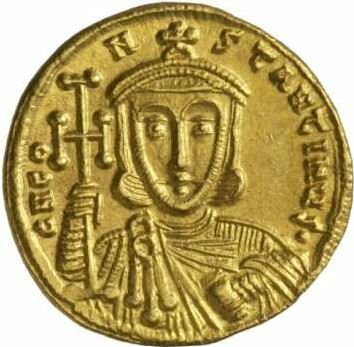 Constantine V was Byzantine emperor from 741 to 775. He was the son of his predecessor, Leo II. Constantine V continued his father's iconoclast policies, and in 754 convened a synod in Hieria. The council approved of Constantine's religious policy and secured the election of a new Iconoclast patriarch, but refused to follow in all of Constantine's views. Nevertheless, the synod was followed by a campaign to remove images from the walls of churches and to purge the court and bureaucracy of Iconodules. His colourful nickname refers to a rumour that he had defecated in a baptism fountain during this campaign. By the end of Constantine's reign, Iconoclasm had gone as far as to brand relics and prayers to the saints as heretical. He died in 775 while preparing for a war against the Bulgarians. He was succeeded by his son, Leo IV.